A former playing field of "The Great Game", explorers have frequented Ladakh long before a certain Bollywood movie made it the must visit destination. Slow on the uptake, Ladakh’s hospitality sector is beginning to catch up with its newfound popularity. 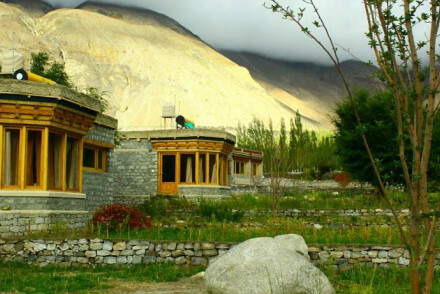 Some of the best places to stay in Ladakh are refreshingly novel. Lying at an altitude just short of 10,000 feet at least one day’s acclimatization should be factored in to any trip, longer if you are planning a trek. With plenty of routes available, from Nubra Valley, to isolated Turtuk and along the Zanskar River there are trails for every ability. Walkopedia is a good source for more information on walking and trekking in the region. 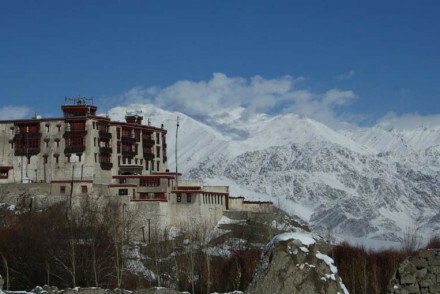 To truly experience its rugged beauty, some of the best places to stay in Ladakh are out of its capital town, Leh. Much of the Ladakh valley is inaccessible during the winter months so it is best visited between April and October. Whilst Indian summers can be unrelenting, Ladakh’s temperature peaks at 30C and its crisp, blue skies against snow-capped mountains are a photographer's dream. From Buddhist festivals at Hemis to white water rafting on the River Indus; meditation with the monks at Thiksey monastery or horseback riding in the Hunder valley there is an activity to suit every interest. If you enjoy outdoor pursuits or are something of a culture vulture then you will love Ladakh. 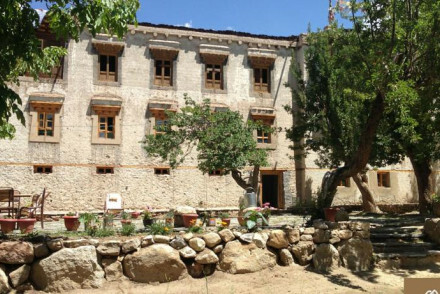 Some of the best places to stay in Ladakh are traditional heritage properties or on the grounds of ancestral and religious establishments. 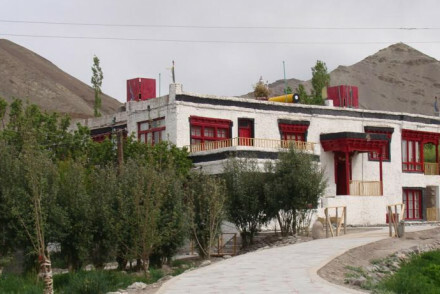 ‘Café Cloud’ enjoys close up views of Thiksey monastery as well as fine Continental and Indian food. Depending on where you depart from, white water rafting along the River Indus is either an exhilarating or peaceful way to see the dramatic scenery. Buddhism is the predominant religion in Ladakh. There are seemingly countless monasteries in the region but you must not leave without visiting Alchi (the oldest), Hemis (home to the largest Buddha statue in the region) and Thiksey for the morning prayers. If travelling further afield then Lamayuru and Likir are also worth a visit. In Leh Town, Open Hand is the go to place for a freshly ground coffee and sweet treat; Bon Appetit serves a blend of continental and Ladakhi dishes – chocolate momos anyone? A day trip away Pangong Lake a visual feast and a must for photographers (amateur or professional). Providing a natural water border you can see as far as Western China. Tso Moriri is another popular destination. 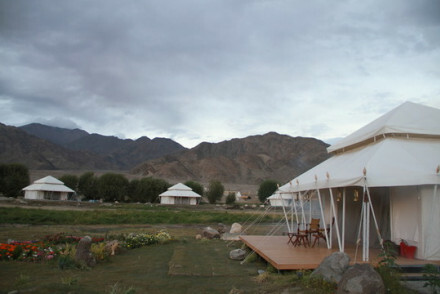 Our pick of the best places to stay in Ladakh are all immersed in nature and ideal for exploring the great outdoors. 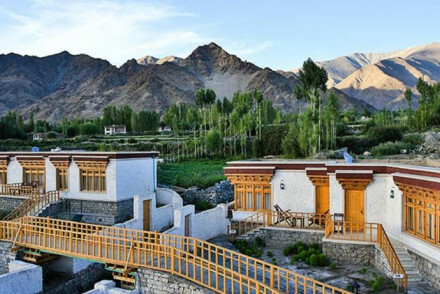 Ladakh’s hotel scene is fast catching up with its newfound popularity and with the likes of The Chamba Camp and Nimmu House this looks set to continue. Both luxurious tented camps with an emphasis on sustainability each property manages to seemlessly combine luxury with culture. A trekking mecca, many a hiking boot has trodden Ladakh’s domineering mountain ranges. 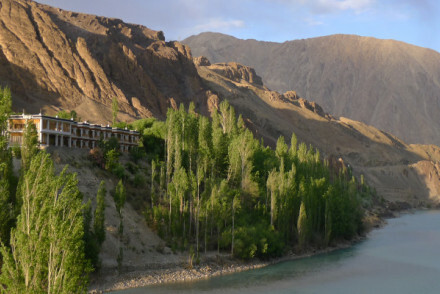 The Apricot Tree is ideally located for routes along the Indus River. Both Woodyvu Stok House and Lchang Nang Retreat provide stays in a traditional Ladakhi house, with welcomed modern additions and chic furnishings. The perfect combination of old and new. Still not sure which to book? From tented luxury to riverside isolation browse through our list of the best places to stay in Ladakh to start to plan your trip. Althernatively you can widen your search and explore all our properties in Kashmir, or contact one of our friendly gurus for advice.